As a child I read my treasured Roald Dahl book collection many times over. The same collection still sits on my bookcase 25 years on. Only recently, for the first time in years, did I dive back into the Roald Dahl archives. Inspired by gifting Fantastic Mr Fox to my niece I wrote a piece on memorable quotes from Roald Dahl classics. This fantastic quote leads me to this vegetarian recipe – deliciously warming cooked red cabbage. It’s perfect for a cold Winter day (but equally something I’ll serve at room temperature as a Summer dish here in Australia). If you didn’t come here for the red cabbage then check out all 12 top Roald Dahl quotes here. They’re funny and inspiring, and certainly not reserved for Roald Dahl fans. Red cabbage in it’s raw form for me never has really hit the spot. Raw red cabbage feels ordinary, like it needs more help to reach it’s delicious potential (and I’m not one for resorting to lashings of mayo or other naughty ingredients to achieve this). That’s where this method of cooking red cabbage comes in. After discovering this recipe (I can’t recall where) cooked red cabbage has been a staple in my kitchen. This recipe is vegan and super nutritious, being packed with fibre, potassium, magnesium and Vitamins K and C.
What I love about this recipe is that the gentle cooking of the cabbage in vinegar creates an extraordinary flavour – cooking also makes the cabbage much easier to digest. as a side dish as part of a Christmas or Thanksgiving feast. Heat the coconut oil in a large pan (don’t underestimate the pan size needed). Finely slice the onion and add to the pan to cook, then add the crushed garlic. chop the cabbage (finely or chunky depending on your preference). Add the cumin seeds and other spices and cook for a minute. Gradually add the cabbage, salt and vinegar and mix well with the onion and spices. Simmer on a low to medium heat for 10 to 15 minutes (stirring a few times). If it feels a little dry add a splash or two of water whilst cooking. Once cooked stir through the fresh parsley. Serve hot or at room temperature and keep leftovers for a couple of days! Inspired to cook more red cabbage? 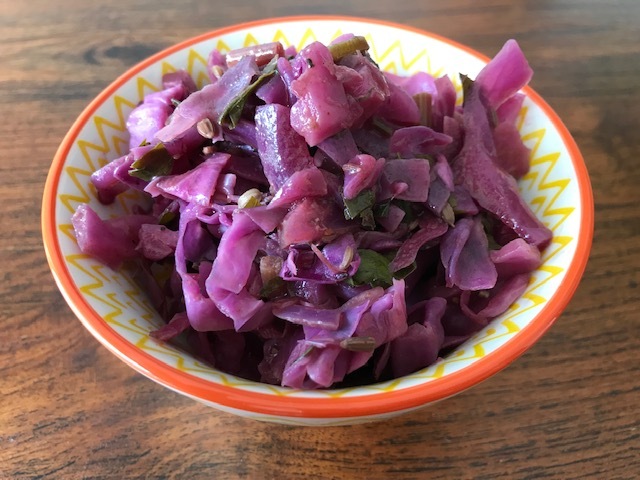 Check out my post for roasted red cabbage steaks – another way to make red cabbage extraordinary. Read here for all 12 quotes. Tags: cooked, recipe, red cabbage, vinegar. Bookmark the permalink. Previous post ← Want your dog to drink more water? Use bone broth! I like red cabbage for its beautiful color and your recipe sounds delicious. Thanks for sharing wonderful quotes I have never read before. Thanks a Megala – so glad you like the cabbage and the quotes too! Interesting! There are not too many cabbage recipes out there! So I was really fascinated with yours. Mine is typically onion, apple, and a little port. Sometimes jelly. I can’t wait to try yours! Hi Chef Mimi – I totally agree red cabbage is a little neglected in the recipe stakes. I think apple pairs well and that’s why the apple cider vinegar works – let me know how you go! 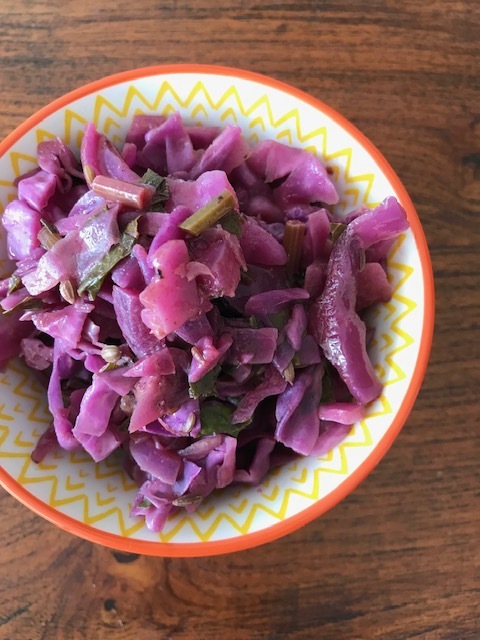 I like warm, comforting food in the winter too and this cooked warm red cabbage looks so inviting! Thanks Sandhya – I’m glad it caught your eye, and I’m sure you could add your Indfused twist on it too! Hi Vero, so nice to hear how it brings back childhood memories. And I should have said in the post – but like you and Chef Mimi point out chopped apples would work a treat in this recipe too! Ah thanks Mary – I hope it makes for a complication free lunch or dinner! Such a wonderful recipe and post but even more, your professional site. So nice to see and read more about you Laura, well done! Ah thanks Annika – yes I set up the Neon Script site for my copywriting – its amazing what you can do with WordPress and a little bit of patience!